Alanna Renee's Magical World collection is pretty...well, magical! Color4Nails sent me three shades from the Harry Potter inspired Magical World collection to swatch and review. Alanna Renee is only available from her in Austrailia, but lucky for you guys Color4Nails carries and ships worldwide! Chocolate Frog is inspired by my absolute favorite candy in the Harry Potter universe. I can see the inspiration for this comes from the chocolate frog wrapping of blue and gold. 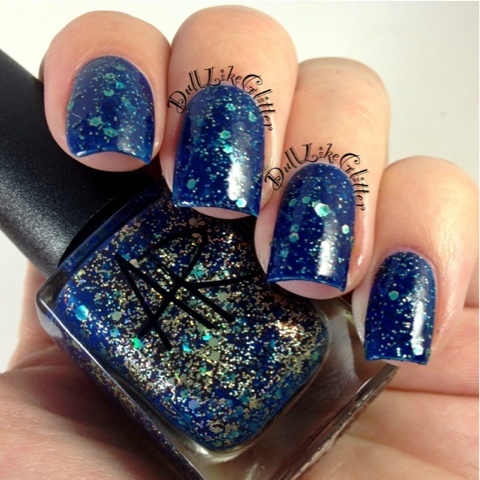 The base is a deep ocean blue filled with holo gold and brown glitters that are beautiful in the light. With this glitter heavyweight I needed a top coat to seal all the glitters in but I didn't mind since they are so reflective. Dementor is a beautiful black beauty. This black base is full of silver and grey mixed glitters. This is so packed with glitters that it almost seems metallic at first glance. Nope! It's just all that glittery goodness. This polish was inspired by those nasty demeanors from Harry Potter. I don't even want to use nasty in the same sentence though because of how beautiful it is. Formula was fantastic and full of glitter in every stroke. I did not think that I was going to like Drink of Despair at first. I'm not really a green girl and this is as emerald green as the Emerald City. On the nail though Drink of Despair has so much depth. It is as if you're lost in a deep green, sparkly ocean. I got a ton of complements on this color. The glitter was catching everyones eye. To pick up Drink of Despair, Dementor or Chocolate Frog world wide just head over to the Color4Nails facebook and send your order via message or email. You can also see all the other lovely polishes that Color4Nails carries.